There are two competing visions of patriotism in this country: one grounded in exclusion and the other in inclusion. The fight against the Muslim ban, the first iteration of which was signed into law exactly a year ago, typifies this battle over American values. President Donald Trump and some of his supporters believe we should close off America to black and brown people and terrorize those who are already here. This is an administration dead-set on demonizing immigrants and stoking fear of Islam. While Trump is not the first racist in the Oval Office, he has invested heavily in white supremacy, both as a candidate and as commander in chief. The president campaigned on exclusion, proclaiming that Mexicans were rapists and that “Islam hates us.” A week into his presidency, Trump authorized the first of three Muslim bans. When courts blocked these executive orders again and again, the Trump administration doubled and tripled down on its efforts to institutionalize Islamophobia. Even though one circuit-court judge wrote that the ban “drips with religious intolerance, animus, and discrimination,” the Supreme Court decided in December that the latest version of it should be implemented while legal challenges continue. The Supreme Court agreed this month to take up the case, and a decision is expected by the end of June. We hope the Court will serve its role as the bulwark of our Constitution. Just this month, the president continued to feed the narrative of exclusion by tweeting that “3 in 4 individuals convicted of terrorism-related charges are foreign-born.” This skewed claim, written in hopes of justifying the Muslim ban, ignores the fact that over the last 10 years, 71 percent of all extremist-related murders in America were carried out by members of the right wing. Last year, 53 percent of extremist-related killings could be directly connected to white supremacy. These are the clear and present dangers the White House willfully ignores in furtherance of exclusion. This administration, which styles itself as the vanguard of a new politics, is really the old guard of white racism. And the impacts have been devastating. A forthcoming report, “Communities on Fire,” by South Asian Americans Leading Together (SAALT) reveals the scale of the violence under this administration. Between election day 2016 and election day 2017, SAALT documented 302 incidents of hate violence and xenophobic political rhetoric aimed at Muslim, South Asian, Sikh, Hindu, Arab, and Middle Eastern communities in the United States, of which an astounding 82 percent were motivated by anti-Muslim sentiment. The 302 incidents are a more than 45 percent increase from the year leading up to the presidential election, levels not seen since the year after September 11. When Adam Purinton shot and killed Srinivas Kuchibhotla in Kansas last February, Purinton screamed, “Get out of my country!” before opening fire. When a Muslim family in Long Island received letters reading, “KKK Hate Muslims, We will kill you,” these messages were just burning crosses in epistolary form. What connects these attacks to the administration’s policies is the ethos of exclusion. One in five perpetrators in the hate-violence incidents that we documented referenced Trump, a Trump policy, or a Trump slogan. The link between the president’s anti-Muslim agenda and escalating attacks is clear and often made explicit. In documenting these incidents, what we see at stake is the principal issue of democracy in our time. While the ideals of inclusion are being threatened, they have been embedded in the resistance movements that continue to strengthen in response to this administration’s policies. When Trump signed his first Muslim ban into law on January 27, 2017, what he witnessed was the equal and opposite reaction. 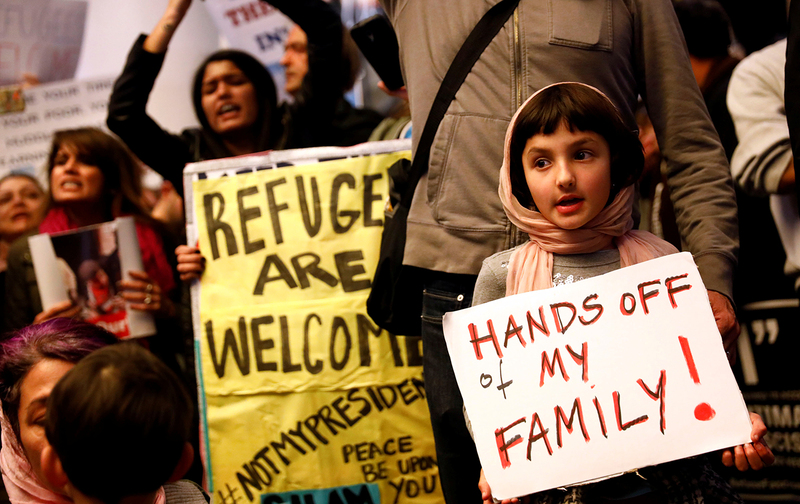 Thousands of people across the country shut down airports and public squares in defiance of this administration’s Islamophobic policies, chanting “let them in” in one voice. When Jeremy Joseph Christian, a known white supremacist, harassed a Muslim passenger on a light-rail car in Portland, Oregon, three passengers stood up to intervene, putting their lives on the line. Stepping up for people who are threatened is indeed the highest form of patriotism. When I joined our communities in Kansas after Kuchibhotla’s murder, organizations and faith leaders spoke powerfully of unity as the key to healing our broken country. The fight for inclusion continues not only in opposition to the Muslim ban, but also in the support for DACA and DREAMers, the efforts to preserve Temporary Protected Status, resistance to anti-immigrant policies like the RAISE Act, and the wider work to protect family-based immigration. In the face of the incalculable damage caused and inspired by this administration’s anti-Muslim and anti-immigrant agenda, resistance movements are challenging all attempts to allege that patriotism means favoring one race, religion, or ethnicity over another. Whether the White House likes it or not, whether the president understands it or not, we will continue to insist upon inclusion as core to our nation and its future. Suman RaghunathanSuman Raghunathan is the executive director of South Asian Americans Leading Together (SAALT), which fights for racial justice and advocates for the civil rights of all South Asians in the United States, with an ultimate vision of dignity and full inclusion for all.